The judges said there was “insufficient evidence” his words amounted to incitement to hatred. 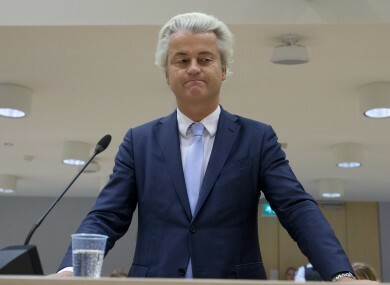 POPULIST ANTI-ISLAM Dutch MP Geert Wilders was found guilty today of discrimination against Moroccans, but acquitted of hate speech in a closely-watched trial ahead of next year’s key election. But they added that there was “insufficient evidence” that his words at an election rally in 2014 amounted to incitement to hatred. The judges also dismissed the prosecution’s request to impose a 5,000 euro fine on the far-right MP, whose Freedom Party (PVV) is eying an upset victory in the March 2017 polls. “In this case, the most important question is whether Wilders has crossed a line. This judgement has answered that question,” the judges said in their verdict. The most recent opinion polls predict the PVV will top the vote, saying it could seize 34 seats in the 150-seat lower house of Dutch parliament, some 10 seats ahead of his nearest rival, Prime Minister Mark Rutte’s Liberals. The three-week trial of Wilders had focused in particular on a statement made at a 2014 local government election rally in The Hague, when he asked supporters whether they wanted “fewer or more Moroccans in your city and in the Netherlands”. Prosecutors told a three-judge bench they had taken Wilders to court because “racist remarks need to be stopped” after police received 6,400 complaints about his comments. “Wilders singled out an entire group of citizens without making any distinction,” the judges ruled. Throughout their case, prosecutors quoted numerous examples of Dutch-Moroccans who said they felt like “third-rate citizens” and that even “children are afraid” because of the politician’s statements. Wilders boycotted most of the high-profile trial, and refused to appear in court for the verdict. If elected as the lowlands country’s new prime minister, Wilders has vowed to confiscate Korans, close mosques and Islamic schools, shut Dutch borders and ban migrants from Islamic countries among a raft of other anti-Islamic moves. His views have seen him receive death threats including from terror groups such as the Islamic State group and Al-Qaeda. He is guarded at all times and called the “best protected man in The Netherlands”. Political observers say Wilders will benefit either way from the verdict due to the publicity the trial has generated. The conviction however will mean he has a criminal record which could for example impact travel plans to the United States, popular daily tabloid Algemeen Dagblad said. Email “Right-wing Dutch MP found guilty of discrimination, innocent of inciting hatred”. Feedback on “Right-wing Dutch MP found guilty of discrimination, innocent of inciting hatred”.